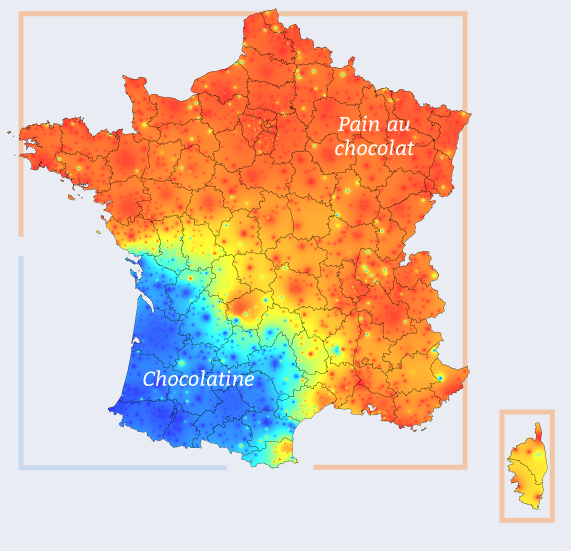 Most French people (84%) use pain au chocolat while 16% use chocolatine a recent poll of 1009 people by Ifop showed. The word chocolatine is widely used in the south-west, notably in Aquitaine and Occitanie. The origin of the modern word is still unsure, as some claim it comes from English-speakers calling it ‘chocolate in bread’ from which we get chocolat-ine. Others say it comes from the Gascon dialect in Aquitaine: in the 19th century they would say chocolatina, a diminutive meaning ‘good little chocolate’ to refer to the well-known French pastry. In Bourgogne-Franche-Comté and in the north-east, some like to say crayon de papier instead of crayon à papier which is the most used in France – though you can just say crayon if the context is obvious. Un crayon à papier refers to an ordinary grey graphite pencil, as opposed to eg. un crayon de couleur (crayon) or an eyeliner. In the Hauts-de-France and Pays de La Loire, there is a tendency to say crayon de bois (wood pencil) while crayon gris (grey pencil) is most used in the north-west, notably in the Morbihan, and in the south-east. If you are looking for a mop in the north of France, use the word wassingue. This comes from Picardy but was taken from the Flemish language and is now in the Larousse dictionary. In the west notably in Charente-Maritime, it is not surprising to hear cinse (it can also be written since) instead of serpillère. In the south of France, you may hear someone say ‘Il y a dégun ici’ (meaning there is nobody here). The word – which means nobody – comes from the Provençal dialect and is used in Provence-Alpes-Côte d'Azur and Corsica. Another word you can only hear in the south is péguer which means to be sticky. It comes from Occitan word pegar. For example, j’ai les mains qui pèguent means my hands are sticky. In the region of Toulouse it is not unusual to hear the word poche (pocket) for a plastic bag. But France is divided on this word. In the north-west, you can hear the word pochon while in the south-east and in the north you may hear sachet. However the most common word is still sac (plastique) all around France. Je bois juste un schluk, you might hear in Alsace. Schluk (pronounced schlouk) comes from Germany and means ‘a sip’. In other regions, people usually say une gorgée. To say a pitcher you can say carafe everywhere in France but in the north-east they tend to prefer cruche while pichet is very used in the north and west. In the south-west, someone can be ensuqué (tired or in a daze). It comes from the Occitan verb ensucà which means to knock out. In Normandy, Brittany and Lorraine, people often say clencher for fermer la porte (to close the door). Clenche originally means handle and it has become a verb in these regions.